MusicLab, the creators of the world's finest software guitar virtual instruments RealGuitar, RealStrat, RealLPC, RealRick & RealEight. If you are serious about creating truly realistic sounding solo and accompaniment guitar stuff for your songs, their product called RealGuitar is just what you need. RealGuitar is a sample-based virtual instrument with an innovative approach to guitar sound modeling and guitar part performing on keyboard. RealGuitar 5 is a combo of two instruments: Classic – all original guitar models with loads of new features, and Steel String – the debut of new guitar sample set with five patches and three tunings for each. The true power of RealGuitar lies in brand new technologies incorporated in this innovative guitar performance tool. 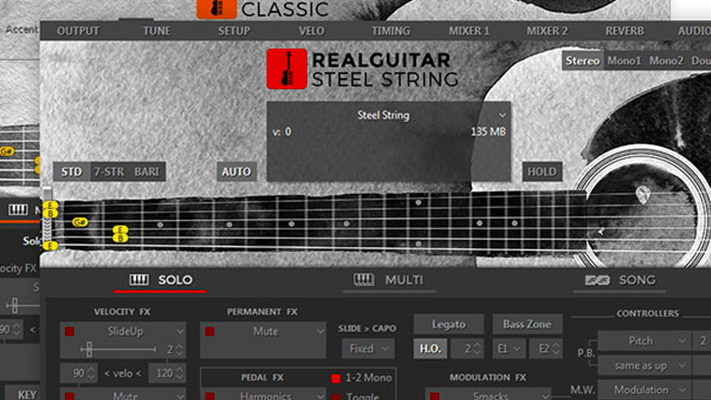 Blayne reviews MusicLab's RealGuitar 5: a sample-based virtual instrument with an innovative approach to guitar sound modelling and guitar part performing on keyboard.